(Newser) – Pope Francis is a published author of a major work for the first time under that name, having issued his first apostolic exhortation. The topic: money. The 224-page document rails against unfettered capitalism as "a new tyranny," and had this to say: "How can it be that it is not a news item when an elderly homeless person dies of exposure, but it is news when the stock market loses two points?" He implored the rich to share their wealth, explaining that just as we are guided by the words "'Thou shalt not kill' ... we also have to say 'thou shalt not' to an economy of exclusion and inequality. Such an economy kills." the pope can work at the white house. he is just who potus needs to advise him! 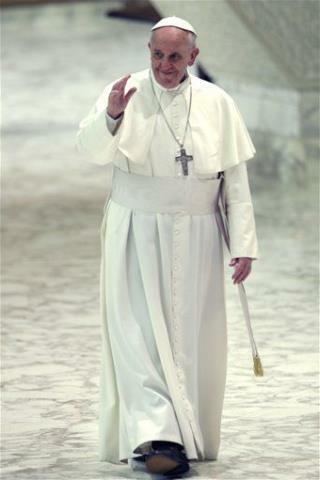 Say what you will about religion and Catholicism but this Pope is pitch perfect. Tough luck your Holy Poopyness. Most commies and libtards are already Buddhists or atheists. You probably just lost ~30% of your devoted cun?servatives.